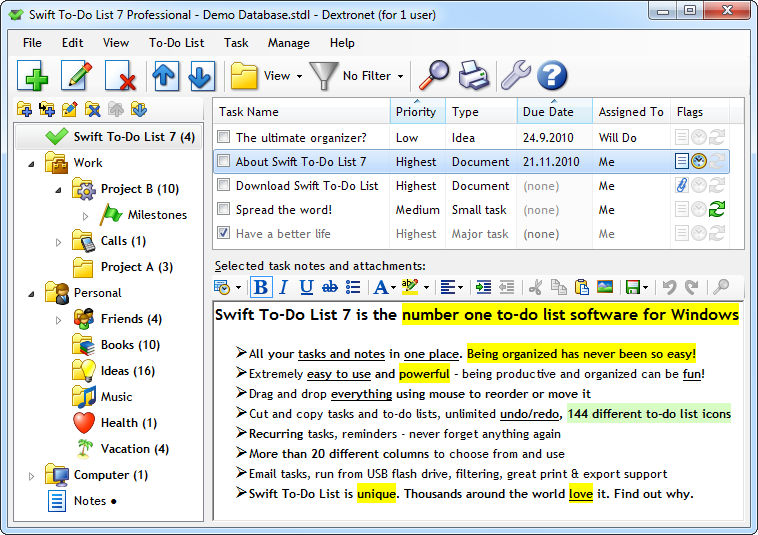 Number one to-do list software for Windows suitable for personal and business use. All your tasks and notes in one place. Powerful yet simple and easy to use. Features include: To-do list tree with icons, recurrent tasks, reminders, task archive, runs from USB thumbdrive, attachments, great export & printing, email tasks, undo/redo, clipboard support, database encryption, reorder tasks using mouse, view modes and filters, customize everything. - All the fields you will need. Fully hide any fields that you don't need (unique feature!). Supported fields include: Task Name, Priority, Type, Due Date, Start Date, Completion Date, Context, Assigned To, Time Estimate, Time Spent, Percent Done, Status, Creation Date and Last Changed Date. - Incredible reminder support. Set reminder for any of your tasks easily. Qweas is providing links to Swift To-Do List 7.51 as a courtesy, and makes no representations regarding Swift To-Do List or any other applications or any information related thereto. Any questions, complaints or claims regarding this application Swift To-Do List 7.51 must be directed to the appropriate software vendor. You may click the publisher link of Swift To-Do List on the top of this page to get more details about the vendor.